Sophsterlicious • UK Blog: Smokey Eyes With The Body Shop. At the Vauxhall Fashion Scout Autumn/ Winter 2012 The Body Shop's head make-up artist Lan Nguyen created some edgy smokey eye looks on the models. The body shop have a video on their you tube channel, and an interview with Lan, which is well worth a watch. Here is the video with Lan. Anyway, I was contacted and asked if I would like to create my own smokey eyes for my blog with the same products (which were sent to me*) that Lan used in the video. I love to play with makeup and create looks, so I said yes! My Look: I opted to do a softer smokey eyed look, and just took tips and inspiration from the video, rather than doing a full on recreation. I like to add my own spin on things. I did really like the navy smokey eye. It's not a look I've ever really worn, because I always use dark greys and blacks to create the smokey look. 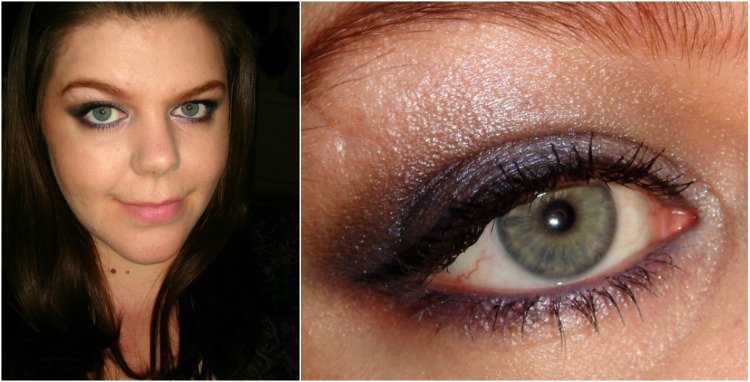 I think the navy tones really brought out my eyes and the shimmering silver inner corner added oomph! I just went for a neutral pink toned lipstick on the lips to keep the focus on the eyes. The Products: I really loved playing with these products. I have some shimmer cubes in different shades that I have neglected for too long, but using these has made me realise how fun and easy they are to use. Unfortunately the concealer I got was too dark for me. But it seems to be a real soft, smooth concealer with good coverage.The super volume mascara is great and really buildable if you want really dramatic lashes. The eye pencils are really nice and blendable, and I love white one, and have never owned a navy before. The surprise was the liquid liner though, I haven't used a liner like the body shop one with the felt nib for years, but I actually found it quite simple. I have been using it loads lately. You can shop online at The Body Shop. Lovely!! That navy really brings out the green in your eyes :) I dont actually own any BS makeup, i really need to take a look!